Dolce & Gabbana have launched The Only One 2, a new fragrance for women. The Only One 2 is a flanker to 2018's The Only One, which was a flanker to 2006's The One. Additional notes include blackberry, freesia, pear, patchouli and ambery woods. 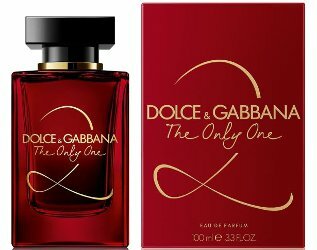 Dolce & Gabbana The Only One 2 is available in 30, 50 or 100 ml Eau de Parfum. No, how???? How can you nMe it The Only One ans then give it a 2 flanker? This is some Prix Eaux Faux nonsense. Maybe this one will get the Melissa Etheridge song.. Yes, for a restaurant, the name of which escapes me now. I guess red bottles are sort of a trend now? working in the industry, the companies have been launching red bottles or red with gold in order to attract more East Asian, mainly Chinese, customers. Red is a stunning colour, but it’s their main focus. They also tend to launch the red bottles strategically before Chinese New Year. I don’t know if anyone has visited a department store recently and noticed any of the limited edition red Chinese New Year packagings that are with Year Of The Pig written all over them. Was going to say the same thing about Chinese New Year, plus I’m sure some are launched just before that for the Christmas market and… Valentine’s Day is less than three weeks away! I wish that trend of the flanker’s name written on the bottle in marker would just, please, go away!!! It looks cheap and there are lots of nice typefaces out there! Tried this today. The One is one of my most-used scents for the office, this one is odd and just doesnt work for me. Liked the coffee, should be more coffee and less floral. Will the next flanker be The only one three? Or The only one two three? Or we’ll get The only two three, then The only three four, then The only four five…? I like the bottle, personally, red bottles were pretty rare up until nowadays, which is a shame, but no interest in the gazillionth flanker of a flanker of a fragrance that was pretty mediocre to begin with. BUT if at least the scent got a brand new name… I might actually have given a try. Me, you have lost, D&G guys, long before… :/. Sorry, I just can’t understand. I can’t. They really backed themselves into a corner with this one.